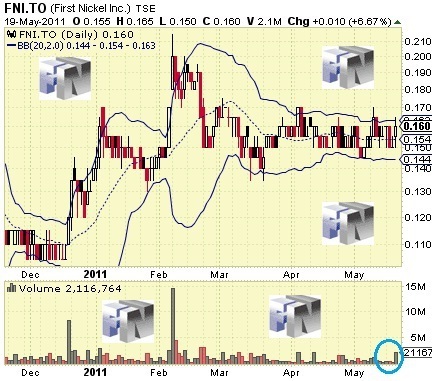 This week is rich in developments regarding First Nickel Inc. (TSE:FNI), (PINK:FNKLF). The company released a $2M flow-through private placement, together with its Annual Information Form for 2010. Investors were partially stirred by the announcements as is evident from yesterday's session on the Toronto Stock Exchange. The trading volume was large - beating 4.5 times the average for the company. FNI went 6.67% up on a turnover of 2.1M shares. In the end of the day, the stock stopped at the well-known resistance level of $0.16. As the graphic indicates, FNI has been floating within a relatively tight trading range over the last two months - between $0.15 and $0.17. It is also confirmed by the narrow Bollinger Bands. From a theoretical point of view, this implies that a change in the share price might occur very soon. The coming days will show if we are right and to what extent. First Nickel could be pleased by the proposed $2M flow-through private placement announced yesterday. It will guarantee the company greater stability in a financial aspect. The financing is expected to be closed in the end of May. The positive facts about First Nickel might be completed with some figures from the financial statements. The company ended 2010 with the impressive $29M in cash and equivalents, not accounting for the above-mentioned $2M offering. On the negative side, we might point out several not so pleasant facts regarding First Nickel. Among them - a net loss of $9M for 2010. This is so because the company is still in the exploration phase and has not progressed to the production stage as yet. Nevertheless, First Nickel has promised investors to reach annual production of 10M pounds of nickel and 7M pounds of copper by mid-2012.